In 2015, CAE Inc., a world leader in training for civil aviation, defence, and healthcare, took a big leap forward: revolutionizing the layout of their Montréal head office, transforming it into innovative workspaces and saying goodbye to assigned offices! As it grew, CAE developed its head office in a number of pavilions (18 in total). Finally, it was no longer possible to acquire new parcels of land to expand the building, as the site is surrounded by several expressways. CAE was also experiencing – and still is today – accelerated market growth. This meant hiring new teams, and finding new spaces for them to work in. So, it was crucial for CAE to optimize their existing total area of almost 1 million square feet. The challenge was to adapt the work environment to the constant need for growth within a limited space. To do this, CAE chose a bold approach reflecting current trends in workplace layout: the Activity Based Working (ABW) approach. This layout concept starts from the principle that employees perform a number of tasks in a single day and need to choose from among different work contexts depending on the task to be accomplished: concentration, collaboration, socialization, sharing, and/or learning. In this environment, employees are not assigned to a particular workstation. They are free each morning to decide how, where, and with whom they want to work. The work space is designed to make it possible to perform various activities during the day: have a confidential phone conversation, work with a small groups, hold a video conference, and more. An ABW layout seemed to be the perfect solution for CAE, as it would make it possible to reduce the number of physical workstations assigned and configure the space recovered into activity zones corresponding to employees’ different needs throughout the course of the day. This form of layout, however, involved major challenges at the acoustical level, compared to the arrangement of conventional offices. In open spaces, the noise level varies constantly, as teams move freely around the work environment. It is, to all practical purposes, impossible to anticipate where the workers and groups will gather. From the beginning of its renovation project, CAE partnered with the team at Soft dB, worldwide experts in acoustic and vibration products and research for more than 20 years. The sound masking technologies developed by Soft dB enabled CAE to solve the acoustical challenges arising from its choice of layout. In architectural acoustics, the available options to improve acoustical comfort and reduce distractions are sound absorption, sound blocking, and sound masking. The use of absorbent and blocking materials can be effective but can also be costly and place limits of the use of spaces, and costs increase further when attempting to retrofit existing environments. Sound masking is therefore a clearly superior acoustical solution, especially in open-plan office spaces, due to its low cost and high design flexibility. The masking technique consists of adding a neutral background sound to the work environment through strategically-placed loudspeakers in such a way as to equalize the sound field and reduce speech intelligibility. In open spaces, sound masking makes conversations effectively unintelligible outside of a certain radius. Employees gain in acoustic comfort due to the reduced noise pollution. This increases concentration and productivity on the job. Sound masking is also effective for closed spaces, as it preserves the confidentiality of conversations whilst keeping spaces flexible (walls no longer need to run slab-to-slab above the ceiling!). Any future reconfigurations of the offices becomes much easier. An office is a dynamic space where sounds and noise pollution can vary a great deal depending on the schedule and the activities underway. To be an optimal solution for these spaces, sound masking must also be able to adapt to these changes: it must increase during very active periods and be more discreet when things quieten down. The patented system developed by Soft dB offers an exclusive function: the ability to adjust the masking volume automatically in response to the level of activity. In each zone where it is installed, the system analyzes the sound activity in real time based on data supplied by small sensors installed in the ceiling. Thanks to a unique signal-processing procedure, it automatically adjusts the volume of the sound masking upwards or downwards, depending on the level of the intruding conversation and other sound distractions. The ability of the Soft dB masking system to adapt to noise variations caused by group movements in a way that is both gradual and imperceptible to the space users makes it an acoustic solution that is particularly suited for ABW layouts. 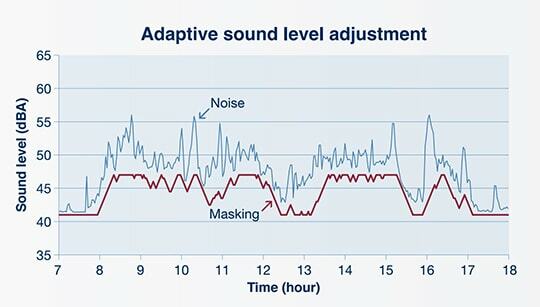 The Soft dB team first installed sound masking at CAE for two pilot projects. Early results were conclusive and met staff expectations (satisfaction level of 80%). Following this, CAE decided to make sound masking a standard component for its work spaces and to continue the gradual installation throughout their head office. It’s not always easy for employees to transition from conventional offices to an ABW layout concept. Management of occupant acoustic comfort is key to successful integration with this new environment. Soft dB is proud to have contributed to the modernization of the facilities of its client, CAE. Acoustical experts associated with the project were able to demonstrate the effectiveness of their sound masking solutions in an open environment that presented numerous acoustical challenges. The changes made to the layout of spaces and the use of sound masking enables CAE to offer the 3,500 employees at its head office an innovative, flexible, and “acoustically comfortable” workplace. To find out more about sound masking and its many advantages in the workplace, visit the Web section of Soft dB. Vincent Le Men is a sound masking expert with a degree in mechanical engineering, specialization in industrial engineering. He joined the Soft dB team in 2013 and contributes to the development of sound masking and the sales of systems designed by Soft dB.